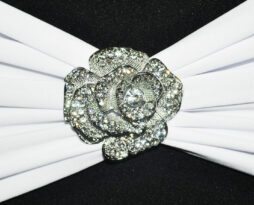 Chair bands , chair belts, and rhinestone buckles for rent for your Chicago wedding event. Some companies call these chair donuts, whatever you call them,, they’re stylish and easy to install. 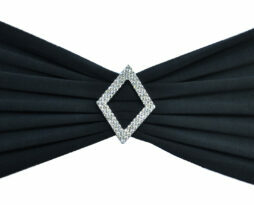 Rhinestone buckle broochs added to the chair band rental adds that final touch. Rent a chair band to use as an applique on your chiavari chair, chair cover, or venue chair. This chair band rental for your Chicago event or wedding is affixed by stretching it over a chair or chair cover. 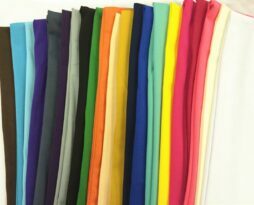 The rental of this chair belt is commonly used for Chicago events such as weddings, formal dinners, corporate meetings, etc. The chair band measures 7″x13″ and is double sided for a clean beautiful look. 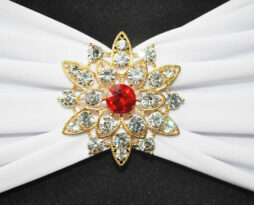 Rent this chair band buckle brooch to use as an applique on your chiavari chair, chair cover, or venue chair. This rental buckle is affixed using a safety pin on the back side of the brooch. The rental of this brooch does not include a chair band, please add the chair band youd like to attach this chair brooch to. EP will only install this buckle on a chair band. These buckle’s can also be affixed to certain napkin folds as well. 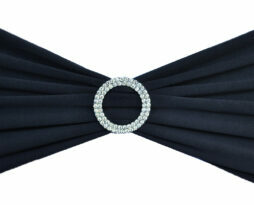 Rent a chair band and chair brooch for our Chicago events such as weddings, formal dinners, corporate meetings, etc. Rent this diamond shaped rhinestone chair band buckle brooch to use as an applique on your chiavari chair, chair cover, or venue chair. This rental buckle is affixed using a safety pin on the back side of the brooch. Rent this floral shaped rhinestone chair band buckle brooch to use as an applique on your chiavari chair, chair cover, or venue chair. This rental buckle is affixed using a safety pin on the back side of the brooch. The rental of this floral brooch does not include a chair band, please add the chair band youd like to attach this chair brooch to. EP will only install this buckle on a chair band. These buckle’s can also be affixed to certain napkin folds as well. 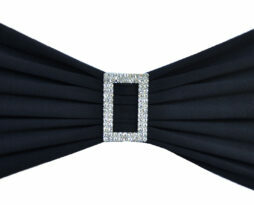 Rent a chair band and floral buckle for Chicago events such as weddings, formal dinners, corporate meetings, etc. Rent this oval shaped rhinestone chair band buckle brooch to use as an applique on your chiavari chair, chair cover, or venue chair. This rental buckle is affixed using a safety pin on the back side of the brooch. The rental of this oval brooch does not include a chair band, please add the chair band youd like to attach this chair brooch to. EP will only install this buckle on a chair band. These buckle’s can also be affixed to certain napkin folds as well. Rent a chair band and oval buckle for Chicago events such as weddings, formal dinners, corporate meetings, etc. 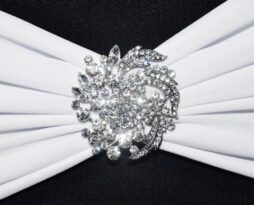 Rent this swirl shaped rhinestone and pearl chair band buckle brooch to use as an applique on your chiavari chair, chair cover, or venue chair. This rental buckle is affixed using a safety pin on the back side of the brooch. 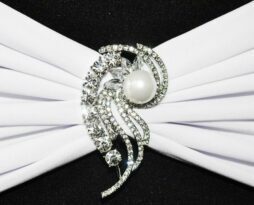 The rental of this swirl shaped rhinestone and pearl brooch does not include a chair band, please add the chair band youd like to attach this chair brooch to. EP will only install this buckle on a chair band. These buckle’s can also be affixed to certain napkin folds as well. Rent a chair band and swirl shaped rhinestone and pearl buckle for Chicago events such as weddings, formal dinners, corporate meetings, etc. 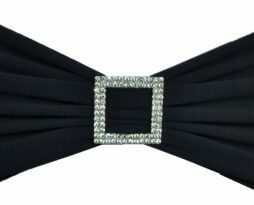 Rent this Rectangle rhinestone chair band buckle brooch to use as an applique on your chiavari chair, chair cover, or venue chair. This rental buckle is affixed using a safety pin on the back side of the brooch. The rental of this Rectangle rhinestone brooch does not include a chair band, please add the chair band youd like to attach this chair brooch to. EP will only install this buckle on a chair band. These buckle’s can also be affixed to certain napkin folds as well. 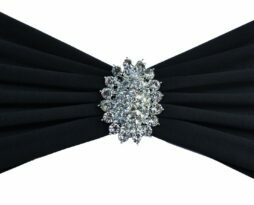 Rent a chair band and Rectangle rhinestone buckle for Chicago events such as weddings, formal dinners, corporate meetings, etc. Rent this rose rhinestone chair band buckle brooch to use as an applique on your chiavari chair, chair cover, or venue chair. This rental buckle is affixed using a safety pin on the back side of the brooch. The rental of this rose rhinestone brooch does not include a chair band, please add the chair band youd like to attach this chair brooch to. EP will only install this buckle on a chair band. These buckle’s can also be affixed to certain napkin folds as well. 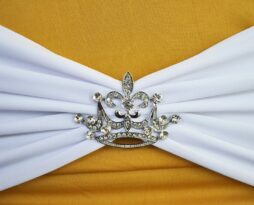 Rent a chair band and rose rhinestone buckle for Chicago events such as weddings, formal dinners, corporate meetings, etc. Rent this round rhinestone chair band buckle brooch to use as an applique on your chiavari chair, chair cover, or venue chair. This rental buckle is affixed using a safety pin on the back side of the brooch. The rental of this round rhinestone brooch does not include a chair band, please add the chair band youd like to attach this chair brooch to. EP will only install this buckle on a chair band. These buckle’s can also be affixed to certain napkin folds as well. Rent a chair band and round rhinestone buckle for Chicago events such as weddings, formal dinners, corporate meetings, etc. Rent this square rhinestone chair band buckle brooch to use as an applique on your chiavari chair, chair cover, or venue chair. This rental buckle is affixed using a safety pin on the back side of the brooch. The rental of this square rhinestone brooch does not include a chair band, please add the chair band youd like to attach this chair brooch to. EP will only install this buckle on a chair band. These buckle’s can also be affixed to certain napkin folds as well. Rent a chair band and square rhinestone buckle for Chicago events such as weddings, formal dinners, corporate meetings, etc. Rent this star shaped rhinestone chair band buckle brooch to use as an applique on your chiavari chair, chair cover, or venue chair. This rental buckle is affixed using a safety pin on the back side of the brooch. The rental of this star shaped rhinestone brooch does not include a chair band, please add the chair band youd like to attach this chair brooch to. EP will only install this buckle on a chair band. These buckle’s can also be affixed to certain napkin folds as well. Rent a chair band and star shaped rhinestone buckle for Chicago events such as weddings, formal dinners, corporate meetings, etc. 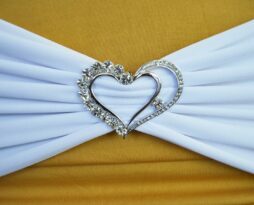 Rent this Two Hearts as One rhinestone chair band buckle brooch to use as an applique on your chiavari chair, chair cover, or venue chair. This rental buckle is affixed using a safety pin on the back side of the brooch. The rental of this Two Hearts as One rhinestone brooch does not include a chair band, please add the chair band youd like to attach this chair brooch to. EP will only install this buckle on a chair band. These buckle’s can also be affixed to certain napkin folds as well. Rent a chair band and Two Hearts as One rhinestone buckle for Chicago events such as weddings, formal dinners, corporate meetings, etc.